Koschei the Deathless is to Russian folklore what giants or wicked witches are to European culture: the villain of countless stories which have been passed on through story and text for generations. 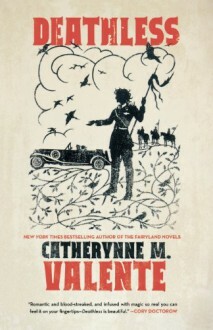 Valente's take on the legend brings the action to modern times, spanning many of the great developments of Russian history in the twentieth century.Deathless, however, is no dry, historical tome: it lights up like fire as the young Marya Morevna transforms from a clever peasant girl to Koschei's beautiful bride, to his eventual undoing. Along the way there are Stalinist house elves, magical quests, secrecy and bureaucracy, and games of lust and power. All told, Deathless is a collision of magical history and actual history, of revolution and mythology, of love and death, that will bring Russian myth to life in a stunning new incarnation.